Are you looking to buy the perfect gift this Christmas for the PC game fan in your life? Well, you've come to the right place, as we've put together this list of brilliant gaming gifts and accessories that will put a smile on any PC gamer's face. 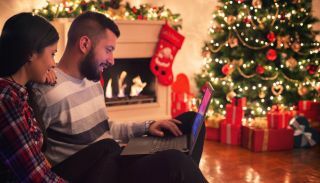 From mice and monitors to hardware upgrades – and even whole gaming PCs for those who have been particularly well behaved this year – this Christmas gift guide should give you plenty of inspiration. If you're thinking of getting them a game, then make sure you check out our list of the best PC games. Featuring customizable weight, the perfect number of side buttons and true RGB spectrum lighting, the Rival 600 will be the centerpiece of any PC gamer's desk. It's also got a killer price, and the Rival 600 performs far better than a mouse in its price range has any right to. Not only does it feature a 12,000 DPI sensor and satisfying mechanical switches, the Rival 600 goes above and beyond with a depth sensor that will all but eliminate cursor sway when you lift your mouse off of the mouse pad. Fancy really wowing your friends and loved ones this Christmas? Get them the stunning Roccat Vulcan 120 Aimo gaming keyboard. Its unique design is gorgeous, and it's a brilliant keyboard in its own right, feeling satisfying and responsive when typing. Not only does this keyboard offer switches that have the tactile feedback that gamers demand, but it’s comfortable to type on and won’t wake up the whole neighborhood. When you add in the jaw dropping aesthetics of this gaming keyboard, there’s no denying that this is one of the best gaming keyboards 2018 can offer. If you're after something a bit more affordable, then this excellent set that combines a keyboard and mouse is a great choice. The keyboard, especially, is particularly impressive, and up there with other, more expensive ‘mem-chanical’ keyboards. The switches here offer a lot of the tactile feedback and deep travel of more traditional mechanical keyboards, and won’t keep your entire house awake while you’re furiously pounding away on it during a intense late-night Overwatch match. This is a great gift for PC gamers who are looking to overhaul their gaming setup. Treat your favorite PC gamer's ears to some sonic bliss this Christmas with a new gaming headset. The Logitech G Pro headset offers fantastic sound quality over long periods of time and little else – but that’s not a bad thing. You’re getting fantastic sound quality and comfort while keeping to a budget, so you’re not paying for anything you don’t need. If you’re looking for something a bit more subtle, but can perform with the best PC gaming headsets, the Logitech G Pro is a great headset. If you're buying for someone who spends a lot of time playing PC games, then why not at least make sure they're sitting comfortably while they do so? The noblechairs Epic gaming chair features a faux-leather covering inspired by racing car seats, combining both comfort and a high-end design to make it one of the best gaming chairs you can buy today. The Epic’s subtle black design is far more elegant than some of the more brightly-colored gaming chairs we've seen as well, which means it can fit unobtrusively into a home without being an eyesore. If you really want to spoil the PC gamer in your life this Christmas, then you could buy them a brand new gaming laptop. Or, you could always spoil yourself with an amazing gaming laptop instead! Either way, you'll want the best gaming laptop money can buy, which just so happens to be the MSI GS65 Stealth. Coming in at just .69 inches thick and featuring impressive hardware like Intel Coffee Lake processors and Nvidia GTX 10-series graphics, the MSI GS65 Stealth packs a ton of power into a very svelte package.